Thank you to Brent aka foliosus@Flickr from Portland, Oregon for sharing today’s photograph with us (original) via the BPotD Flickr Group Pool. Check out Brent’s web site for an appealing mixture of plants and web design. 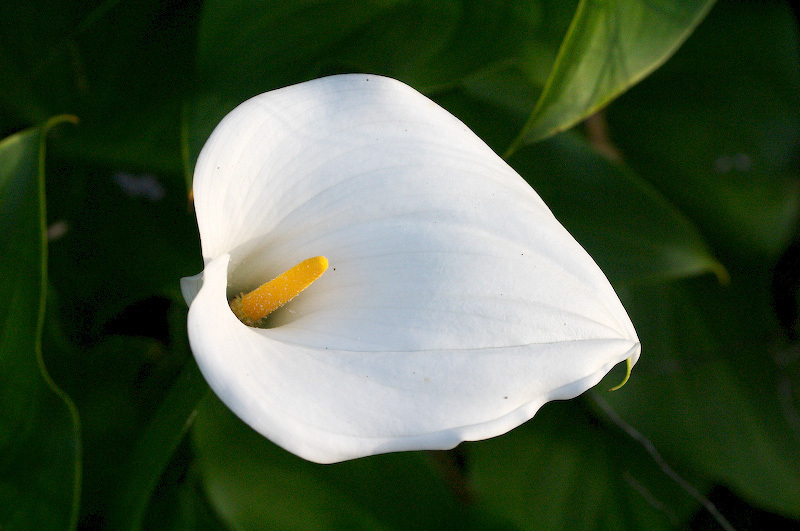 A close-up shot of Zantedeschia aethiopica, or arum lily, was previously featured on BPotD. It’s accompanied by a good set of links about the plant, so I won’t pursue that again today. However, a little bit of botanical history might be intriguing. Zantedeschia is named after the physician Giovanni Zantedeschi, by the physician and botanist Kurt Sprengel. This pattern of medicine and botany intertwined is longstanding, which makes sense considering the original medicines were directly derived from plants (and, of course, animals). As another example, the University of Uppsala in 1692 had a professorial chair in “medicine and botany”. This chair was eventually occupied by Linnaeus, after a swap with Rosén for the chair in “practical medicine” (this meant Linnaeus was now in charge of the botanical garden, chemistry and botany while Rosén headed the university academic hospital, human anatomy, human physiology, etc.). Finally, here’s a search on Google for both “physician and botanist” and “botanist and physician”. Gardening resource link: Kingsbrae Garden in New Brunswick has started up the Kingsbrae Garden Weblog, so you can follow along on how their garden progresses. Discovered via bloomingwriter (jodi DeLong), who posted a comment to yesterday’s photos (her take on Kingsbrae is here).